Digital health technology (DHT) encompasses a wide range of applications and interventions with the potential to address the health needs of an increasingly ageing population. Older people’s engagement with DHT depends on many factors, and this article summarises understanding of the barriers and facilitators to DHT uptake and continued use among older people. Older people’s confidence in using digital technology, their perceptions of personal benefit from DHT, its design, and the support they receive from health professionals and carers in using DHT all affect their level of engagement. Understanding these barriers and facilitators among the older population creates ways to enable greater numbers to benefit from DHT. 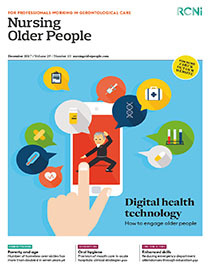 This article provides information for those who work with, or design digital health interventions for, older people to help them to influence older people’s engagement with these rapidly evolving healthcare innovations.